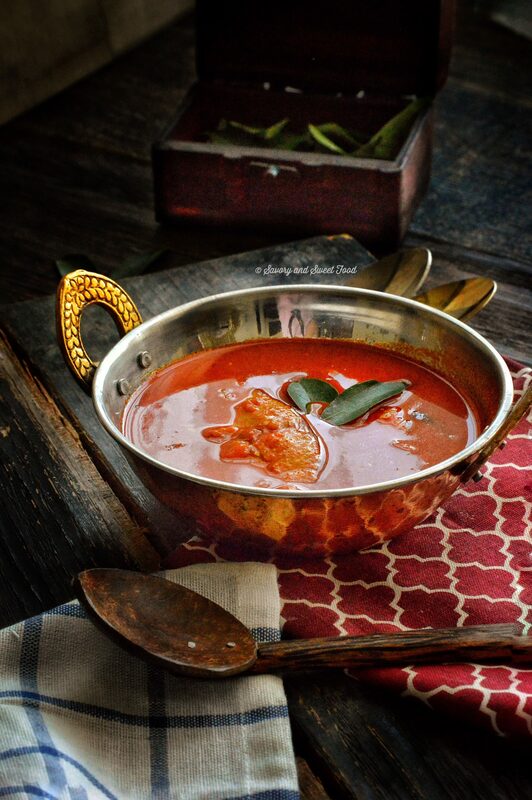 A red fish curry/ Meen Mulagu Curry prepared the Kerala way with spices like red chilli powder, turmeric powder and coriander powder. Tamarind is added for the sourness. 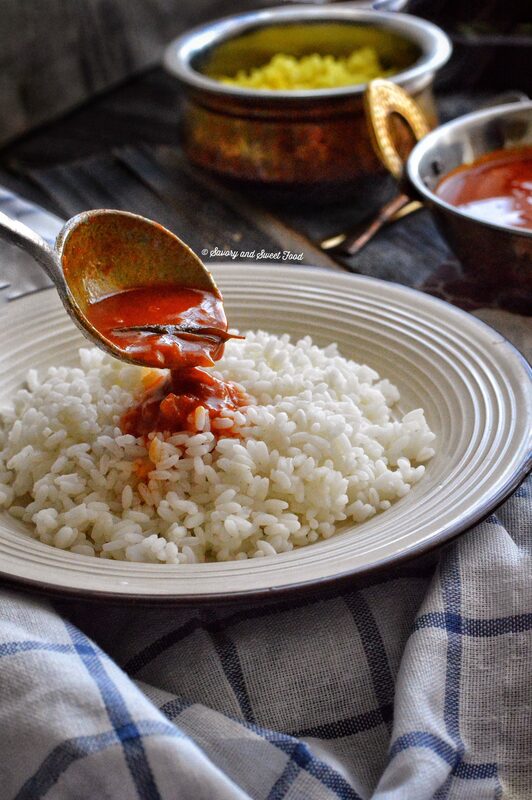 Tomato paste added to the curry makes the gravy very thick and the coconut oil and fenugreek seeds imparts a very authentic flavour to the curry. Kerala cuisine is very famous for its seafood delicacies. 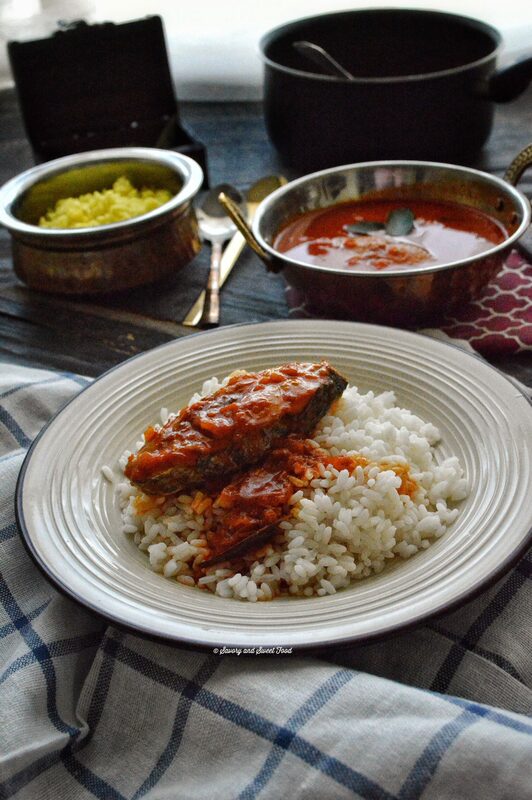 Malayalis can live on fish throughout the year. Seriously! 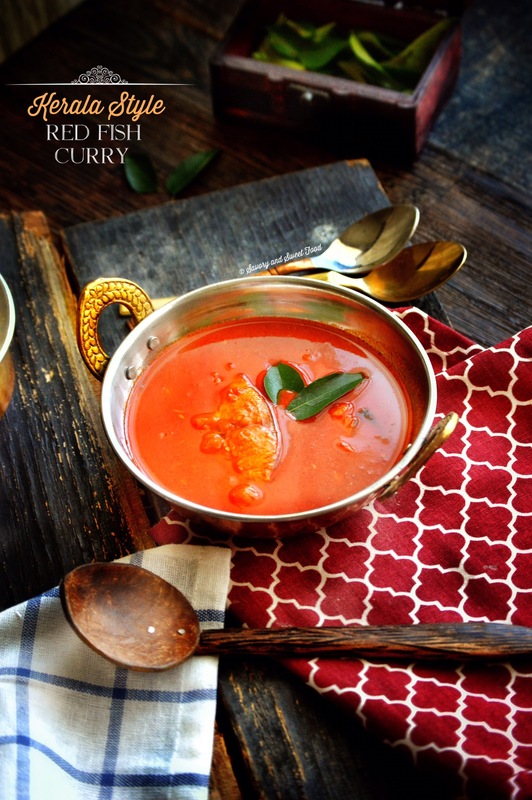 There will be a pot of fish curry simmering away in the kitchens of most malayalees almost everyday. It is a staple food. 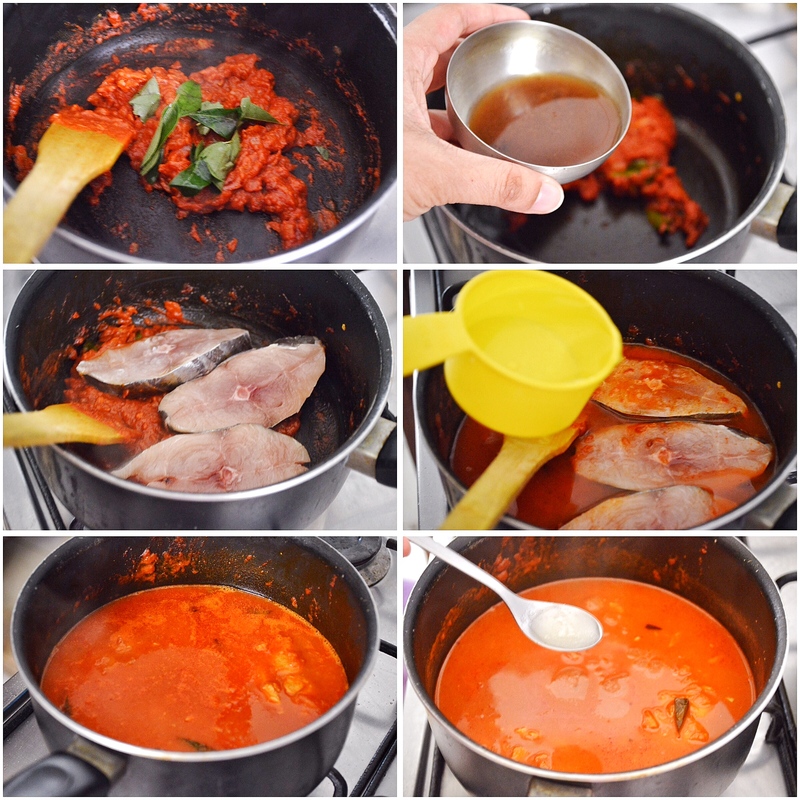 Different households have different method of preparing meen mulagu curry, there will be millions of recipes for this. This is how I make this curry at home. 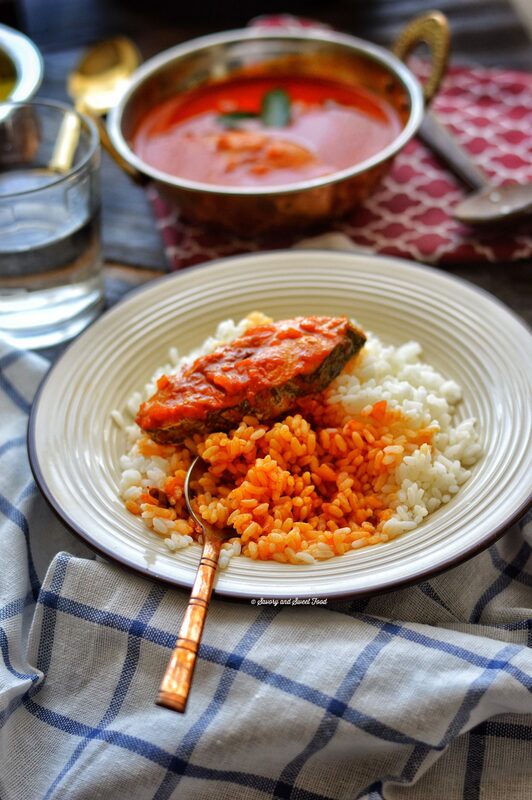 We North Keralites use tomatoes in fish curry unlike the people living in the south. The other difference is that we use the regular tamarind and not kokum (kudampuli). 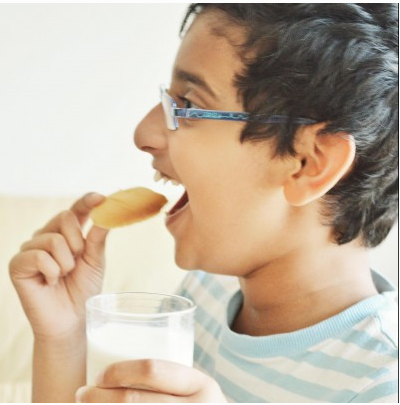 I really love the taste of meen vevichath, which is a Kotayam ( a place in south Kerala) special. But how much ever I try I don’t get that curry right. Will not stop trying though. Will master it someday. My mom makes the curry in a different way and that is my favourite, again I don’t get it like hers. I tried so many times. The most exciting part when I go Dubai is having Uma’s fish curry and rice for lunch. She uses raw mangoes instead of tamarind. Actually I do not like fish dishes at all. I just can’t stand the smell of it, hehe. That explains why there are so less fish recipes in my blog. But my husband is die hard fish lover and so is my 1 year old son…’boohoo’…so I have no choice and I do make fish curry almost everyday now. After so many flop curries I finally got the right recipe for a perfectly thick fish curry, Alhamdulillah. My husband loves this curry so does my son. I like it too. So guys please do give this curry a try. Hope you will like it too. I added tomato paste to the curry instead of fresh tomatoes as that makes the gravy thick. Coconut oil gives a nice aroma to the curry. The curry taste really good if you keep it for sometime and than right after it is made. It tastes really good the next day. Reduce the amount of water if you want the curry to be very thick. Heat 2 tsp coconut oil in a pan. Add in the fenugreek seeds. When it slightly changes color, add in the chopped onions. Now add the spices. Stir well. Make sure that the heat is very low or else the spices will get burnt. Pour 1/4 cup of water. Let it get dried up by cooking for 2-3 minutes on medium flame. Put in the tomato paste. Cook for 4-5 minutes on low heat stirring frequently. Add in the curry leaves. Pour the tamarind water without the pulp. Add salt. Drop in the cleaned fish. Pour 1 cup of water. Carefully mix to combine everything making sure that you don’t break the fish. Cook for 10-15 minutes covered. 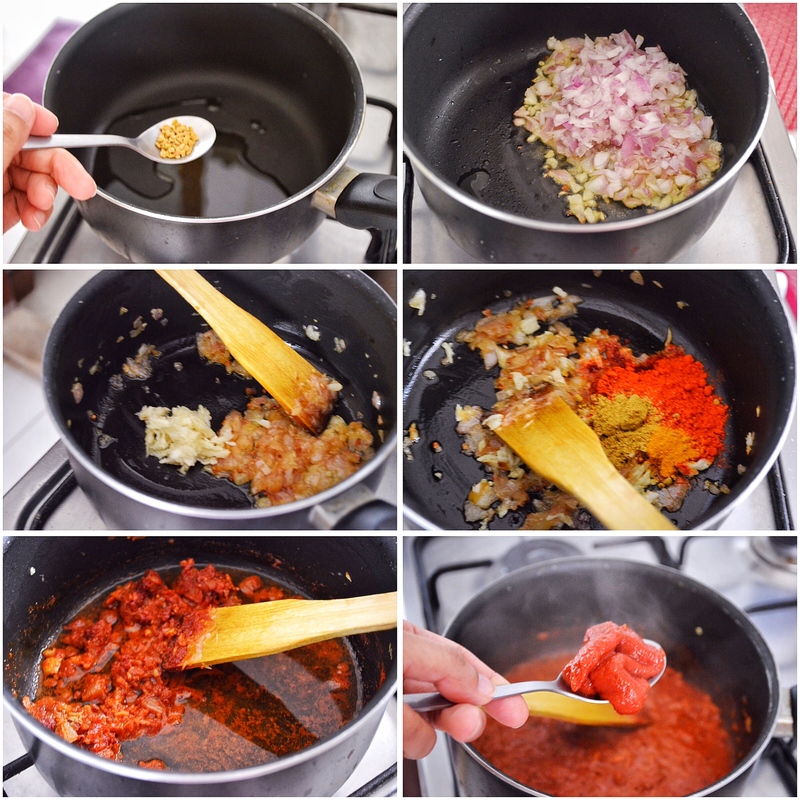 Turn off the heat and pour 1 tsp of coconut oil into the curry. Which fish is that u’ve used? Thank you. 🙂 I used Pomfret. I love fish curries! My favourite by a mile! Can’t wait to try this! I can’t seem to get fresh tamarind around my way, but I can get tamarind paste. Will this substitute in ok? 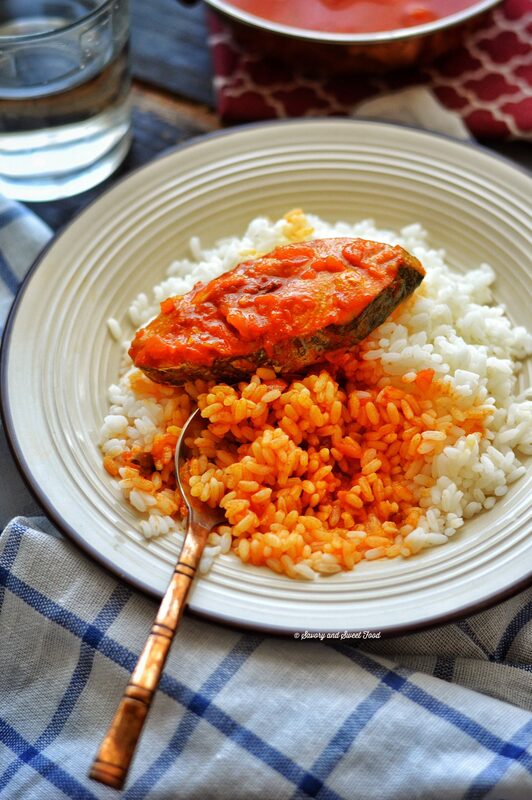 Using tomato paste in fish curry is new to me. It looks yumm.. the red color is tempting me to try.. between you used kashmiri chilli powder? But if you can tolerate the heat, you can use the usual red chilli pdr.